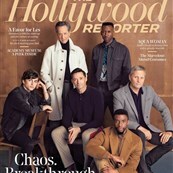 Next stop on the Award Season Express, it’s The Hollywood Reporter’s actor roundtable, featuring Mahershala Ali, Viggo Mortensen, Timothee Chalamet, Chadwick Boseman, Hugh Jackman, and Richard E. Grant. This group actually makes me wonder how far in advance they book these things, because Hugh Jackman is a ??? at this point, but a month ago, we didn’t know The Front Runner was going to flop, which has pretty well killed his campaign. 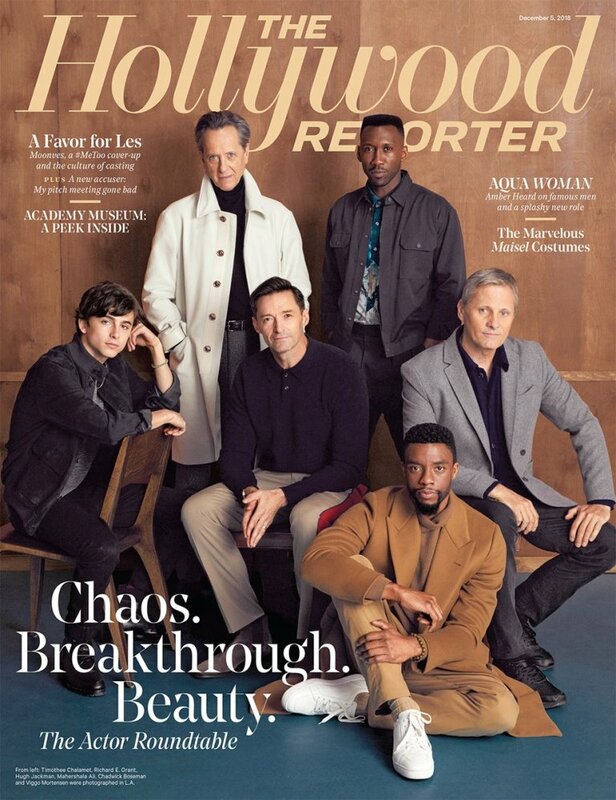 And while it feels a little like wishful thinking, I am glad to see Chadwick Boseman there, because if anything, he is the face of one of the most discussed movies in the race, and I am SUPER glad to see Richard E. Grant. I am, however, bummed there is no Hugh Grant, which means that I am the only person taking his Oscar campaign seriously. These roundtables have become an essential part of an Oscar campaign, and as a result, they are increasingly tame and uninteresting, but this one prompted a few eyebrow raises. (Lainey: hilariously, Timothee Chalamet is barely allowed to speak.) One comes from Boseman calling acting “a blue-collar job”. I get what he’s saying, that it’s not actually that glamorous, that the day-to-day grind is tiring, with long days and frequent overtime. But I think Ali puts it better when he calls acting “workman-like”, because people who get paid what they do are not blue-collar workers, no matter how physical their job gets. It just made my eye twitch a little because that sounds like something Chris Pratt would say. The other brow-raising moment comes at the end, when Mortensen is asked if he would play Othello. Thank god he says “no”, even though he does frame it as, “I could totally do this, and it would be amazing, but all the criticism would ruin it.” Baby steps, I guess. As these roundtables—and similar events, like Variety’s “Actors on Actors” series—play a part in campaigning, it’s as important to note who isn’t here as who is. The most notable absences from this table are Christian Bale, Bradley Cooper, and Rami Malek. Cooper seems likely to be on the director’s roundtable, with the narrative of the actor turned wildly successful director. But Bale and Malek? Bale is coming in hot with Vice, which some people love and some people hate, but everyone can agree Bale is amazing. He could be Cooper’s day-ruiner, at least in the acting category. And Malek is fronting a legit blockbuster—exactly the kind of movie the Academy is so desperate to promote. Why isn’t he here? I understand passing on Bale, as people are only just now seeing Vice and clearly this thing was booked a while ago. But Malek? I would love to know the logic there. Bohemian Rhapsody opened a month ago, plenty of time to invite him, unless this thing actually was booked during TIFF, which based on this lineup doesn’t seem impossible. Seriously… Hugh Jackman? I know we like him and all, and he’s got all those famous friends, but he’s not even this year’s most deserving Hugh. That would be Hugh Grant. His work in Paddington 2 is being completely ignored and that is infuriating.